Restoration operates on a lean, though effective budget. This is possible through our disciple-making model that is focused on equipping multiple lay leaders to lead discipleship groups in homes, restaurants, and coffee shops. Even our corporate gathering meets in a donated space, to create a scalable model for ministry multiplication. Everything we do is designed to make disciples out of people who are currently far from God. If you would like to invest in the Kingdom of God by giving to Restoration, make checks to "Restoration Church of the C&MA" and mail them to P.O. Box 844 Amherst, OH 44035. Or, donate online by clicking the "Give button below. We use a secure system and can accept one-time gifts or automated, recurring gifts. Thank you for supporting Restoration! Take some time to pray about how much God would like you to give (Ps. 37:5). Commit in your heart to give that amount on a regular basis (2 Cor. 9:7). Abide in Jesus as you give (John 15). Online: Fill out the form below to create an account and give a one time gift or set up recurring giving. Check: Checks can be made out to "Restoration Church of the C&MA" and mailed to P.O. Box 844 Amherst, OH 44001 or put in the offering basket. 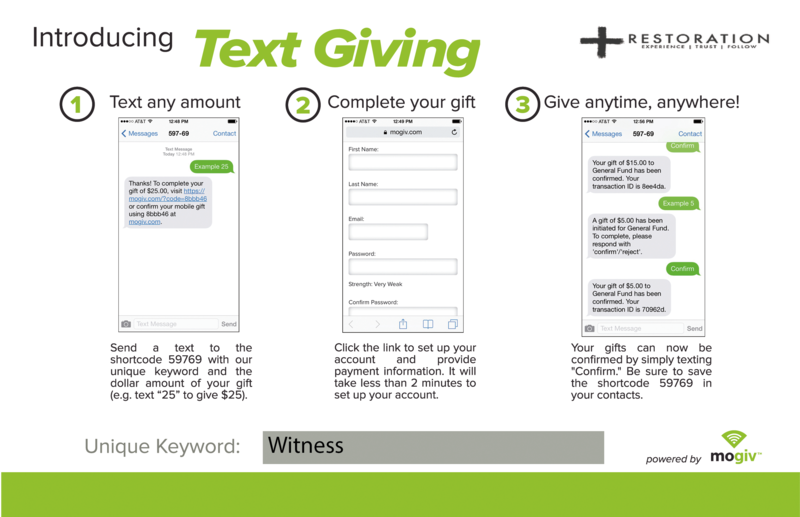 Text: You can give via text right from your phone by texting "Witness" and the amount to 59769. Click here for further instructions. Thank you for helping us make disciples! By the way: we recently changed giving tools, if you had recurring giving set up before, please sign-up again through our new system. Contact our treasure, Micah Judy at finance@restorationhcn.org with any questions. Giving resources the Church to make disciples (Mathew 28:19-20). Giving reflects a heart of obedience and faith in God (1 Corinthians 16:1-2, Luke 21:1-4). Tithing (10%) was a part of the Old Testament Law, something we are no longer under. It seems that God used the concept of giving 10% as a tool for teaching trust. In the New Testament, giving was an act of trust that was completely dependent on the direction of God and not under obligation. Rather than see giving as a legalistic requirement, God encourages us to give cheerfully in accordance with what He has led us to give and how we have committed (2 Corinthians 9:7). We advise raying for God's direction and give accordingly. Restoration has an intentionally lean budget. As a house church network, we avoid the expense of a building. We exist to make disciples who make disciples, and our expenses reflect that purpose. We pay our pastor to make sure he has the time to develop disciple-makers and equip leaders and we have a few small operational expenses (liability insurance, employment taxes, printing, etc.). Because we are structured for multiplication, we don't need to significantly increase operational expenses as we grow. Rather than expand operational expenses, we would like to expand ministry as we grow. This is an overview of our proposed long-term budget. In order to reach this goal, we have to first meet our operational expense budget.